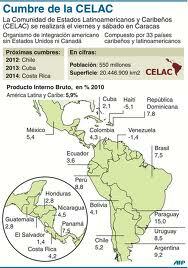 The idea to found a new Comunidad de Estados Latinoamericanos y Caribeños has come about over the last three years. Just when the markets were beginning to crumble in December 2008, the then, President of Brasil, Luíz Inácio Lula da Silva, called the Presidents of the 33 countries to the first Summit, Cumbre de América Latina y en el Caribe (Calc) to discuss strategies to safeguard the region against the financial crisis. 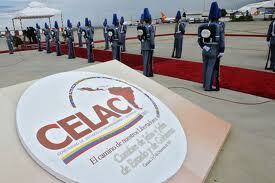 Later in February 2010, the Calc met again in Cancún, México and it was there that they agreed that they needed a permanent forum for discussions, hence the birth of Comunidad de Estados Latinoamericanos y Caribeños (Celac) at the end of 2011 in Caracas. As well as discussing the financial crisis, the Presidents of Estados Latinoamericanos y Caribeños also discussed other business related to the cohesion and stability of the region. President Evo Morales asked for support for Bolivia to reach an agreement for sea access for his land-locked country. The President of Colombia, Juan Manuel Santos, advocated for a common policy to rid the region of narco-trafficking. The potential of español as a world language is increasingly based on its great diversity. The hybridisation of español in so many countries is becoming a major advantage in a globalised world. At the beginning of the 21st century, many believe there is a renewed "Siglo de Oro" in the Spanish language, partly because there has never been so many people writing in Spanish and writing in such an interesting way. The existing prejudices between Iberoamérica and Spain are being broken down and eliminated and a new common linguistic territory is being created in español. Evidence of this is the founding in 2011 of Amazon.es, selling books, DVDs and other products to the increasing market of Spanish speakers worldwide. Amazon (and its Kindle e-reader) already has plans to enter Chile, Argentina and Brazil too. Interestingly, speakers of español are not limited to América Latina and Spain, instead within the EU (excluding Spain) there are 30 million Spanish speakers. Currently in the US, there are 40 million Spanish speakers and in Brasil, 5.5 million Spanish speakers. The US is further predicted to be the world's largest Spanish speaking nation by 2080 according to recent studies. The recently celebrated XXV Feria Internacional del Libro de Guadalajara, México in 2011 celebrated its 25th anniversary with a list of 25 secretos literarios de América Latina. In the video below, the writer, José Saramago, explains in his own words the importance of the cultural and commercial exchanges already taking place within the Iberoamérica region in the 21st Century.